DISCONTINUED This item has been discontinued. We recommend The Omega VRT instead. Introducing the Hurom Slow Juicer. A revolutionary new design in Juice extractors that will turn other juicers on the market upright! The Hurom Slow juicer takes the single auger design made popular first by Samson, Solo Star and Omega Juicers, and takes the concept one step further..
We now offer the 3rd generation Hurom HU-100 that includes the GE ultem screen. The Ultem Screen is 8 times stronger than the normal plastic screen that was formerly included with the 1st and 2nd generation hurom juicers.. We recommend the ultem screen for people that want to juice daily. 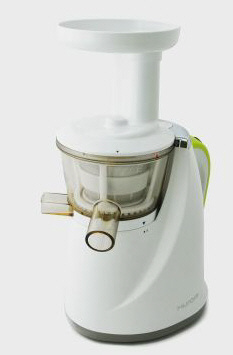 The hurom slow juicer will juice fruits, vegetables and even wheatgrass, slowly and efficiently. More efficiently than other single auger style juicers. less space than most juicers on the market! 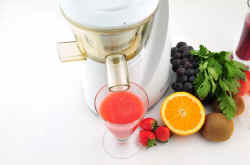 This juicer is also sold as the Oscar 930 Pro Juicer in other countries. amount of fruits. Peels and skins can be also used in various pastries, jams, soups, etc. none of the separation that occurs with other juicers. This is a slow juicer. For best results when juicing with this juicer.. Slow Down! Gravity feeding is sufficient for feeding most produce into the juicer. Feeding produce too fast may cause excess pulp in the juice. 35 years. 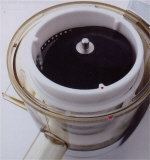 Many familiar US juicers under popular brands are manufactured by Dong-Ah of Korea. Hurom has finally brought this experience and expertise to the US market under its own brand. Dong-Ah has closed their US office that handles Customer Support and Warranty Service. They have outsourced the Customer Service and Warranty Support to Roland, Inc. Please contact them at 800-321-2226 for warranty service. We now include the upgraded bowl that has the pulp extraction rubber plug on a hinge, so it won't get lost. World's first patented juicer with the LSTS method. It is completely different from the original grinding style juicing method. Achieving the maximum nutrients, vitamins, taste and juice from the minimum amount of produce by squeezing rather than grinding. Get maximum amount of juice with a minimum amount of fruits. Peels and skins can also be used in cookie, jam, cake, etc. 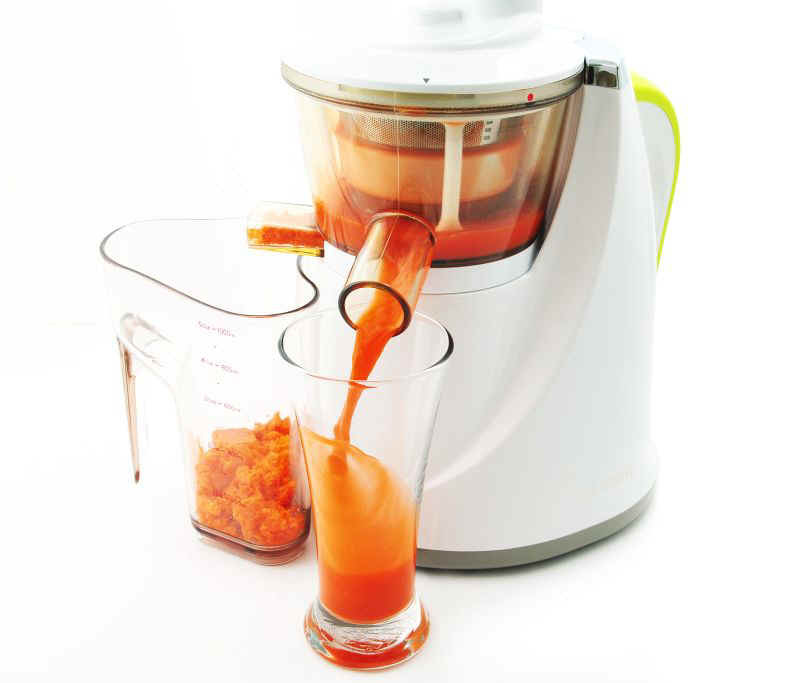 The Huron juicer minimizes the noise by squeezing slowly rather than grinding at high speed like centrifugal juicers. The 8x harder auger is manufactured out of GE Ultem material. The 10 Year Motor Warranty ensures your juice will run for 10 years. 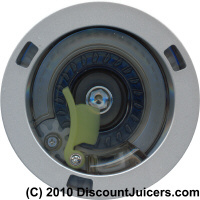 The rest of the parts on the juicer have a short 1 Year manufacturer warranty. PLEASE NOTE: Hurom has recently reduced the length of the warranty from 10 years on the WHOLE machine to 1 year on the juicer and 10 years on the motor. For this reason, we strongly recommend the Omega VRT330HD which is virtually the SAME juicer with a FULL 10 year warranty on all whole machine. The Hurom juicer excels at making juice out of your favorite leafy greens and wheatgrass. Warranty: 10 Year Warranty on Motor. 1 Year on other Parts.